Serving Pizza, Subs, Wings & More! Family favorites of pizza and wings and more are served in a casual atmosphere at A Slice of the 80’s on 19 Congress Street in Bradford, Pennsylvania. 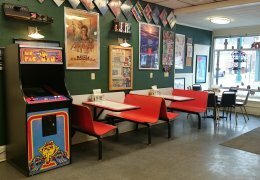 1980’s memorabilia, including movie posters, and a working video arcade Pac Man game add to the fun. 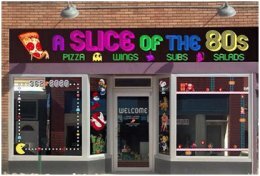 A Slice of the 80’s specializes in hand tossed pizzas & specialty pizzas. They offer a wide variety of subs and large fresh salads. Customer favorites include their steak subs and salads, which are made with choice quality shaved prime rib. Also, the restaurant offers different daily soups throughout the week. Pick up, delivery, or dine in options are available. Browse their 80’s themed menu today!